Kettlebells are an effective way to build strength, flexibility, and endurance. You could do many of the exercises that you are already familiar with, like bench presses, curls, and rows, with kettlebells but the real magic of kettlebells is in doing exercises like swings, snatches, cleans and jerks. The ballistic core strengthening movements that work well with kettlebells help you to build muscle and flexibility in a practical way that many of the regular exercises that require you to lay down underneath a bar just don’t do. You will not only build muscle, but the moves need a full body effort, including working your cardiovascular system as well as increasing core strength and endurance. You have many options when choosing a kettlebell. They aren’t cheap if you want to get a good one. They can vary in price, from $20-$200. You can go as cheaply as building your kettlebell, but that could end up very dangerous if you don’t do it exactly right. I would look at it like an investment that will pay off to you for many years to come. Here are some things to look out for if you want to choose the right kettlebell for you. It’s better to go a bit heavier than you think you can handle. That way, you can work on technique, get stronger and not outgrow it too quickly. You might pick up a kettlebell for the first time and think that the weight is way too much, but we won’t be using the kettlebell the same way we use dumbbells. We won’t be using it for bicep curls or shoulder flys. The exercises we do with kettlebells like swings and snatches use multiple large muscle groups, so you’ll grow into the kettlebell quickly. Your kettlebell should be heavy enough that you have to snap your hips forward quickly to use your momentum to get the kettlebell moving as opposed to muscling the weight up with your shoulders or other upper body muscles that you shouldn’t be using too much. According to Mike Mahler’s Kettlebell Buying Guide, determine the best weight by doing overhead lockouts with a dumbbell. Hold the dumbbell straight up over your head for 10 seconds with your elbow slightly locked. If you don’t struggle, then that should be the best size kettlebell to start. Cast-iron kettlebells, which increase in size as the weight gets bigger, and competition style kettlebells, which are made of steel and are all the same dimensions regardless of weight. There are a couple other essential features to look for. Make sure there are no rough edges on the handle. Bloody, painful hands are not what we are after here. Wear gloves, but you will still get calluses. Check the underside of the handle for an even smoothness. Make sure that the handle isn’t too wide, or too narrow that you can’t use both hands. Make sure that there is enough room between the handle and the body of the bell (ideally about 55mm). It is best to have a feel of the handle in your hand and make sure that the handle is not too thick, which will make it harder to grip. Make sure it feels comfortable in your hands. It must be smooth all the way around. You don’t want any sharp bumps that will cut your hands. Do not buy kettlebells that have triangular or squarish handles. Quality kettlebells come with smooth, curved handles that can be gripped anywhere on the handle, not just the top part. Only kettlebells that have machined flat bases are acceptable. Otherwise, they won’t stay in place and can quickly roll over. Competition kettlebells are a higher quality option if you are serious about kettlebell training. 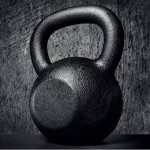 For the rest of us, a good quality cast iron kettlebell will be great. Try not to get the painted ones. They can chip more. You can find more affordable vinyl or plastic kettlebells, but the drawbacks outweigh any money you might save. Cheaper kettlebells typically don’t follow any standard shape or size. This difference will change the mechanics of many kettlebell exercises. If you are just out to gain some home gym fitness and strength, have some fun and build muscle fast, a cast iron kettlebell will work great. There are also adjustable kettlebells and kettlebells that come in two or more pieces. I don’t recommend these because they’re merely less secure and safe. Plus, I’m old school! You never know when someone might be pawning off a great kettlebell. Check garage sales and pawn shops for great deals. Also, look out for manufacturers that offer free shipping on kettlebells as a promotion. If you found this interesting, please share it.